Prep Time: 5 min. - Cook Time: 20 min. - Total Time: 25 min. Preheat oven to 375˚F. Arrange bacon in single layer on parchment paper–lined baking sheet. Stir brown sugar with paprika. Sprinkle evenly over bacon in thin even layer. Bake, turning once for 20 to 25 minutes or until bacon is lightly crisp and sugar is golden brown and bubbling. Transfer to parchment paper–lined tray; let cool completely. Substitute cayenne pepper for hot smoked paprika. Serve as a simple appetizer standing up in a tall glass. 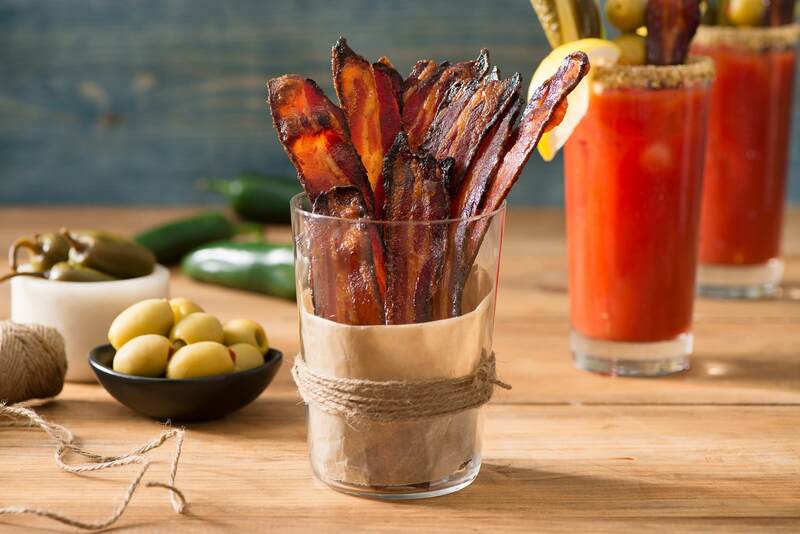 Chop candied bacon and sprinkle over baked sweet potatoes, add to grilled cheese or served with baked Brie cheese.